You may represent yourself in an Idaho divorce. This article discusses form CAO D1-5, the petition which is filed if you wish to separate from your spouse and minor children are involved. The document is available on the website of the Idaho Judicial System. Idaho Complaint For Divorce CAO D1-5 Step 1: At the top left-hand corner of the first page, enter your full name and address, as well as your telephone number. Give the county and court number in which you are appearing. Idaho Complaint For Divorce CAO D1-5 Step 2: Give the names of both spouses and write in the filing fee. Idaho Complaint For Divorce CAO D1-5 Step 3: In section one, enter the state in which your spouse currently lives. Idaho Complaint For Divorce CAO D1-5 Step 4: In section two, give the date and location of the marriage ceremony. Idaho Complaint For Divorce CAO D1-5 Step 5: In section four, give the names, dates of birth and current addresses of all minor children. Indicate if the wife is pregnant. Idaho Complaint For Divorce CAO D1-5 Step 6: Section five concerns any previous or current legal actions involving the children. Idaho Complaint For Divorce CAO D1-5 Step 7: Sections six and seven require you to describe your proposed custody arrangements. Idaho Complaint For Divorce CAO D1-5 Step 8: Section eight requires you to consider child support payments. You must provide all information requested about extended visits, childcare costs including medical and insurance expenses, and tax benefits. Idaho Complaint For Divorce CAO D1-5 Step 9: In section nine, list any children the wife had during the marriage by a man other than her husband. Idaho Complaint For Divorce CAO D1-5 Step 10: Sections 10 and 11 concerns separately and jointly owned real estate property. Section 12 concerns community personal property. Idaho Complaint For Divorce CAO D1-5 Step 11: In section 13, note all joint debts. In section 14, note any debts incurred since separation. Idaho Complaint For Divorce CAO D1-5 Step 12: If you wish for your former name to be restored, indicate so in section 15. 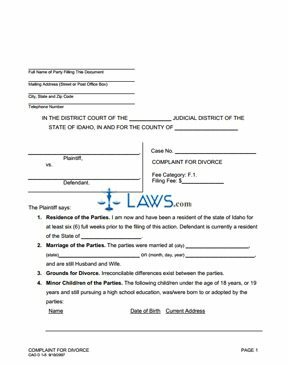 Idaho Complaint For Divorce CAO D1-5 Step 13: Sign and date the form before a notary public.